Maggie is the most focused dog I know. She keys in on everything around her. We joke that she has no chill because we feel she’s always watching and assessing her surroundings. That’s why her reactivity confused us. In our mind she was a smart and alert dog. We call her the thinker. And so we couldn’t understand why certain dogs or situations triggered her to lunge. I’ve read countless books and articles on the issue of a reactive dog. The two that come to top of mind is Behavioral Adjustment Training 2.0: New Practical Techniques for Fear, Frustration, and Aggression in Dogs as well as Culture Clash: A New Way of Understanding The Relationship Between Humans and Domestic Dogs. Both have been fantastic in opening my eyes up in learning how to understand the difference between humans and their canine companions, learn how to listen to their dog language, and how to become a better communicator. There isn’t a straight line to my brain’s lightbulbs. I tend to zig zag. I read a lot of this and that. Attended various different training sessions … watched hours of training videos while applying concepts on a daily basis. And I had a ton of information in my brain like a mushy pile of spaghetti. I’ve been looking for a word … a framework to put structure in my efforts to comprehend my dog’s behavior and how to approach her training. And finally one morning while drinking my coffee and browsing Instagram a trainer coined it for me. 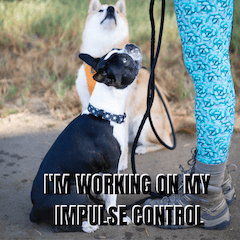 All the behavioral issues I was working on … stemmed from my dog lacking impulse control. It’s not because she’s not focused. In fact she’s SO focused she is compelled to investigate (this is when she lunges at dogs she shouldn’t). It’s been labeled as lack of social manners. Or lack of socialization or lack of focus … but all of these words while they have worked for others weren’t clicking with me when it applied to Maggie. Just like people each and every dog is different. On the polar opposite of Maggie is my sister’s dog Pepper who has GREAT impulse control. In fact she has so much self control I call her “No Emo” dog. I’ve put her in so many different new situations she just sits back watching with her eyes and doesn’t react. The foundation in helping my dog is learning how to become a better communicator. And this goes both ways. I need to learn how to understand what my dogs are telling me. And in turn I need to understand how to communicate back to them. As of writing this we’re not on the same page. I haven’t figured it out. Right now they are speaking dog. And I’m speaking human. What I can confidently say though is I’ve reached an awareness. Switching subjects … in yoga we always end each practice by saying “Namaste” which loosely translates to honoring the sacredness in you as I do in me. But that doesn’t mean to see each other as the same. It’s to understand the uniqueness each spirit has. I think the biggest mistake I have done in raising my dogs is that I failed to see the “dog” in them. And applying human logic in how to communicate with them. When in actuality the best way for me to honor our relationship is to learn how to communicate effectively. Which means … understanding how they think … not trying to force them into how I think. So now instead of trying to figure out how to “change my dog” or how to “train my dog” I’ve shifted my focus to trying to understand what my dog’s needs are. In Maggie’s case … she needs to learn how to have greater impulse control. And to do this I need to learn how to become a better communicator with her and support her making the right decisions in this journey. I was attending pack walks on a sporadic basis two years ago. But that trainer left our city to move up North and left a vacuum in San Diego. About a year ago Real Dog Box started to organize Short Leash Socials. During these events we would gather while maintaining distance to expose our dogs to others and then proceed with an evening hike (it was the peak of summer) which would summit at a peak during full moon. Oh and we had a little champagne at the top too … to celebrate. Unfortunately the full moon would only happen over a weekend several times a year. In a conversation with the co-founder Ruby we realized be both seeked these events to help our reactive dogs. Her 150 pound Anatolian and my 17 pound Boston Terrier both needed help in this area. So we started to organize a pack walk every two weeks. We choose different locations each time weather permitting. Yesterday we hit the trails for the first time since the summer … because it was finally cool enough to do so. We had a great turn out. There were a few new dogs. A few dogs that needed help in the impulse control department and the vibe was perfect. You see just like we humans, putting our dogs in a social setting like this is like us attending a social mixer. They look around, size each other up and then have to learn how to “be” with the pack. One of our friends dog mom to @iamasuperhiro took Maggie and leashed her to Hiro. That was the first time Maggie had walked with him and she did great. During the walk she didn’t lunge, growl or snap at anyone. So just like a proud kindergarten mom I was beaming from the back of the pack watching her good calm behavior. It’s quite magical when you put over 20 dogs together of varying temperaments and social skills and see how they learn from each other. Most of them already come with impulse control. It’s the balanced dogs that help guide those that need it. There wasn’t any aggression or obnoxious behavior by the end of the walk. The dogs were calm, relaxed and overall having a great time. And that’s why we co-organize these pack walks and attend others is because we want to set our dogs up for success. To learn how to control their impulses and learn social skills from other dogs. As an added bonus … we meet with other dog like minded people and have a great time. I love this post! I’ve been working on my communication with Watson as well. It’s so funny – when he’s pulling on the leash, asking him nicely as opposed to using a stern voice works best. But when he’s riled up by a dog walking near us, I have to be stern. I wish the little guy would understand English! Hi Michelle – yes it’s constant training. I’m realizing some dogs are more easygoing than others. Orbit is a doll to walk by herself. She doesn’t pull she just follows behind. Maggie’s the one that is independent and hard headed lol. Hope you have a great week.